Sketch A Showing the Primary Triangularion in Section No. 1 from 1844 to 1859. 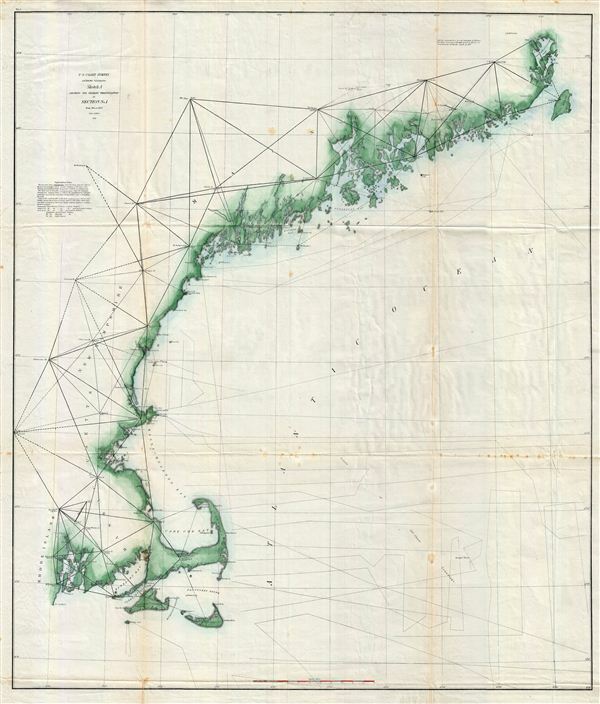 An attractive example of the U.S. Coast Survey's 1859 triangulation chart of the New england coastline. The chart covers from Narragansett Bay eastward, past Cape Cod, Boston, Portland, and Penobscot Bay as far as Passamaquoddy Bay and Grand Manan Island. Shows the primary triangulation points used in setting up the survey throughout the region. Compiled under the direction of A. D. Bache, Superintendent of the Survey of the Coast of the United States and one of the most influential American cartographers of the 19th century. Bache, A. D., Report of the Superintendent of the United States Coast Survey, Washington, 1859. Very good. Blank on verso. Minor toning on original folds. Minor verso repair along folds.